As a former Cast Member and self-proclaimed Disney trivia junkie, visiting all the Disney Parks around the world has been a goal of mine for awhile. I have already visited both Disneyland, Disney World, and Disneyland Paris. 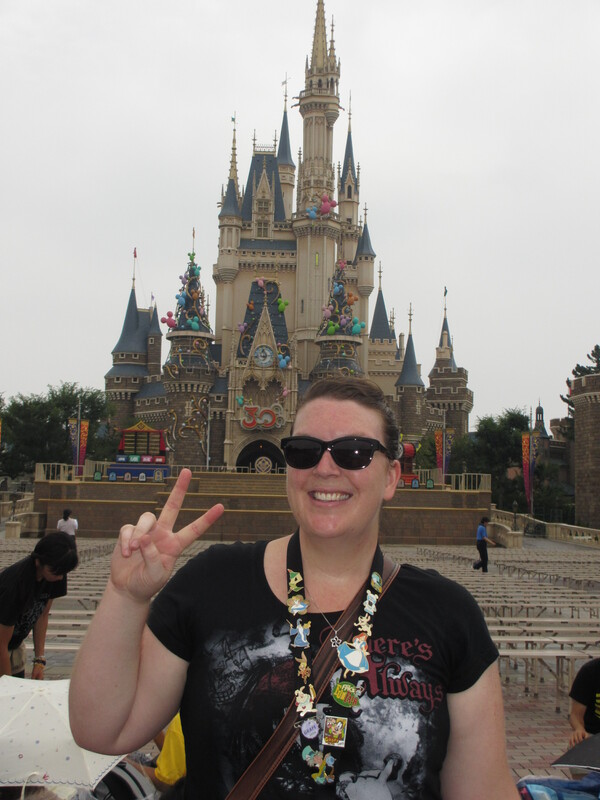 I got my chance to visit Tokyo Disneyland during summer vacation while I was teaching English in Korea. Tokyo is an easy two hour flight from Seoul. The V fingers kind of have a mind of their own. I was ready to take the picture like a regular American tourist and then just before the shutter went off my brain said something like “Wait! You need the peace sign in this picture!” And up my hand went. It’s like my hand is Korean and the rest of my body just lets it have it’s way. It also felt very similar to home. It had a lot of the same attractions, like the Haunted Mansion, Splash Mountain, Space, Big Thunder, it’s a small world, Jungle Cruise and so on. It was also insanely hot, humid and crowded. I only went on two rides. I got a fast pass for the Haunted Mansion, which was exactly like home except in Japanese. It did however have the same foyer, expanding room hallway que as Florida, and the old attic scene pre 2005 in CA. If you are considering visiting the park, I would not recommend the summer season. It is ungodly hot and humid and insanely busy. I knew all this going in so I have no reason to complain, but if you can go another time, do it. I spent much of the day walking around taking it all in, snapping pictures and eating. Just like at home there are not many places to avoid the heat and also sit down unless you are eating at a table service restaurant. For lunch I had pizza and walked with it until I found shade. I think the one of the best parts of the eating experience was that when you ordered the “set” a drink was included, and that drink could be iced coffee. It really hit the spot. A lot of the park was very familiar. Much of it was because they had the same rides and lands as the parks in the US but in the case of New Orleans Square, it was exactly the same as it is at home. Pirates of the Caribbean was the only attraction in the park with a wait less than an hour. Only twenty minutes in fact. The ride is exactly the same as at home, even has the Johnny Depp animatronics and the Davey Jones waterfall effect. The other animatronics speak English like they do at home, (“Don’t tell him Carlos! Don’t be chicken!”) it’s the voice over that is done in Japanese. Good thing I knew what was going on. The only difference I noticed was that the men pirates were still chasing the ladies in the village scene. Japan doesn’t give a crap about political correct tail chasing. Later on I watched the parade and the fireworks show, and took a dozen pictures of the castle as it lit up while the sun set. The Park was celebrating it’s 30th Anniversary, calling it the Happiest Year. Great pictures and it sounds like fun. It’s amazing how much alike the parks are.